WASHINGTON, DC -- Ukraine faces another difficult year as it grapples with two daunting challenges: Russia’s continuing effort to use the unsettled conflict in the Donbass to destabilize Kiev, and the need to implement critical economic reforms. 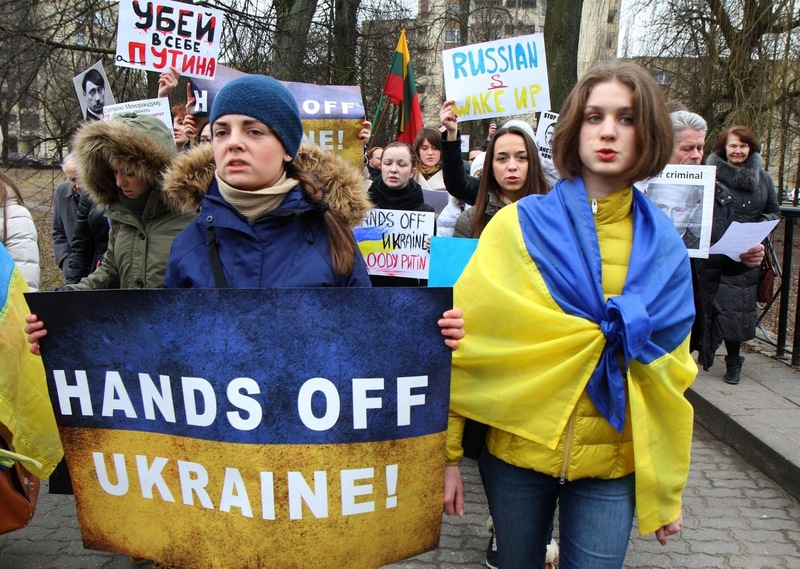 Demonstrators wear the Ukrainian flag and hold posters reading "Hands off Ukraine" during a protest against Russia's intervention in Ukraine in front of the Russian embassy in Vilnius. In order to put the country on a path to becoming a successful European state, Ukraine’s leadership has to solve these two problems simultaneously. As Kiev tries to do so, the West can and must help—but U.S. and European support will be affected by the depth of Kiev’s commitment to reform. After last summer’s fighting, the ceasefire in the Donbass seemed to hold better in the autumn, but key elements of the Minsk II agreement have not been unfulfilled. While Moscow’s focus has shifted to Syria, it is not yet apparent that the Kremlin wants a settlement in eastern Ukraine, as opposed to maintaining an open wound that Moscow can use to pressure Kiev. Unfortunately, the Donbass seems destined to remain a frozen, or not-so-frozen, conflict for some time to come. Ukraine should nevertheless do everything that it can to implement the Minsk II provisions. That will increase the thin prospects for their success. It will also allow Kiev to place the responsibility for the failure of Minsk on the separatists and their supporters in Moscow. Among other things, that could prove key to sustaining European support for sanctions on Russia. On the challenge of reform, Kiev has taken important steps, under difficult conditions. But President Petro Poroshenko and his government should do more, and they should do it faster. That means reforms in the areas of public administration, deregulation of business, privatization of state-owned enterprises, and further steps to build a competitive and transparent energy sector—all while avoiding populist measures that the country’s budget cannot afford. Accelerated reform includes a more vigorous effort to root out corruption. Given his performance over the past year, it is not clear why Prosecutor General Viktor Shokin remains in office. That office needs a shake-up, and the country badly needs to reform its judicial sector, so that citizens and business can have confidence in a fair court system. Absent greater progress on such questions, the Ukrainian public will grow more disillusioned, as opinion polls already indicate. And Ukraine cannot afford a perception in the West that it is slow on reform; that would erode U.S. and European support. Provided that Kiev accelerates reforms, the West should increase its support. That means making available to Ukraine an additional $5 to 10 billion in credits and grants to create a margin of comfort for more radical reform. It means providing greater military assistance to help Ukraine defend itself. And it means continuing to press Moscow, including with sanctions, to end its aggression against Ukraine. Ukraine faces a tough road ahead and, unfortunately, will not be able to find its way out of crisis by the end of the year. Still, Kiev can make decisions now that will put the country on the right path, one that begins to realize the promise of the Euro-Maidan and that will sustain Western support. As Ukraine progresses down that path and becomes stronger and more resilient, the chances for a real settlement with Russia will grow.